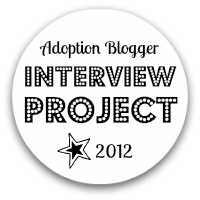 I am excited to once again participate in the annual Open Adoption Bloggers Interview Project, to raise awareness about adoption and to also share perspectives from various key participants (birth parents, adopted adults and adoptive parents) within the adoption constellation. This year I have been paired with the lovely Lindsay, an adoptive mom who blogs at On Loan from Heaven. Lindsay is a married mom of two through domestic open adoption. The story she shares particularly resonated with me when reading about her son Hunter and his challenges. Lindsay puts it all out there, heart and soul. Read on as she answers my questions. I realize the post is quite long, however I felt it should be presented in its entirety. I encourage you to check out more about Lindsay and her parenting journey at On Loan from Heaven. You said, “We wish there was a rulebook to tell every waiting family and every birth-mom what to do and at what point to do it in the adoption process. Well, there isn’t… so we’re all doing the best we can.” What advice do you have for waiting parents? Waiting to bring your child home is so many things… Exciting, terrifying, relaxing, anxiety producing, and so much more. It also has the ability to make or break you. It challenges who you are and everything you know about yourself. While the wait is sometimes painful, don’t let it be all for nothing, Allow it to change you. Let it make you who you need to be for your child. Use your time wisely. Go on dates with your spouse; they’ll be few and far between soon. Prepare your family for the arrival of your child; a car seat or pack n’ play can make soon-to-be grandparents feel part of your wait and also lets you feel less alone but more prepared in your wait. Prepare your home, whether it’s stockpiling diapers and wipes, painting their room, or using the time you have to clean and organize. Get ready. Allow yourself to get excited but also take advantage of the opportunity you have to enjoy life as it is with the people who are already in it. It’s now 2013, almost five years since you posted this prior to adopting your daughter, “… and I know now that being vulnerable with them was one of many steps we had to walk up before we could bring home our baby.”. What have you learned about vulnerability during this time? How does it impact you as a parent and your perspectives about adoption? Vulnerability has been the most difficult of skills for me to learn, and I do believe it is something to be learned, that needs to be practiced over and over again. While it’s so important to use discretion when being vulnerable, it’s also equally as important to spend time building a support system of people who you can practice vulnerability with now so they’re already in place when you need them. I’ve learned that God can use my vulnerability to not only bring clarity to me in certain situations, but also to speak to others’ who may be struggling through something that they’re not quite ready to talk about yet. This has especially proven to be true in my discussions with people about our adoption experiences. It’s been amazing to watch people open up with me the more I’m willing to open up with them. Vulnerability in parenting is a fine line to walk. Discretion plays a key role once again, especially with younger children. At the same time, I’ve learned that it’s never too early to start a foundation of trust and respect with my kids. I find it very hard to trust and open up to people who aren’t open and honest with me, and it seems to be the same with my kids. The older Hannah gets, and the more willing I am to openly apologize or admit to a wrong-doing, the more honest she is with me and the more she is able to acknowledge her own mistake. You compare your daughter’s “First Mom” to Mary—Jesus’ mother, the quintessential birth mom.” Can you share? That was a hard post to write! When processing the role Mary played in Jesus’ birth and life, I kept coming back to my kids’ first moms. Mary carried and birthed her child, fell in love with him, and was asked to hand him over to be someone else’s son, to be God’s son. Hannah and Hunter’s first moms, while the choice was theirs to make, were also asked by God’s plan for their lives to hand their precious children over to be raised as someone else’s son and daughter. For this reason, Joey and I take our role as their parents so seriously. They’ve been given to us, not only by God, but by their first moms, too. As H2 grows older, I watch their first moms struggle at times as we are the ones who know them best, the ones who they run to, who discipline and make decisions for them. I can’t imagine what that must feel like and I can imagine no greater responsibility! Mary was able to watch her child, to watch Jesus thrive and grow under the watch and care of God. We want H2’s first moms to be able to do the same. Your brothers were adopted. How does this impact you as a parent? Do you find that your discussions have evolved with your brothers? How have their open adoption impacted you and you openness? Do you have open adoptions with your children’s birth parents? My brother’s adoptions have greatly impacted our view of adoption. More than that, the way my parents have handled their adoptions with openness has impacted us as adoptive parents. Adoption was a household topic when I was growing up. My brothers never found themselves uncomfortable when they had questions about their first moms or adoptions. If Mom and Dad couldn’t answer a question, they had access to the people who could answer them—their first moms. We want the same for our kids. When and if questions arise, bringing up the subject of their adoptions won’t be embarrassing or uncomfortable. We feel that this is key to them understanding who they are and where they’ve come from as they get older. You reflect on lessons often throughout your postings. What lessons has adoption provided? What lessons have you gleaned from parenting a child with special needs? I have complete control of our calendar and his medicine schedule. I can make sure he gets every service and therapy he needs. I can stay on top of insurance companies and call an office a million times to get test results. I cannot, however, determine Hunter’s future. There is no amount of appointments or medications or phone calls that will ensure that he will grow up to be a healthy and happy boy. The biggest lesson I have learned is that God has entrusted us to care for him on a daily basis, to make sure that his needs are being met. In the same way God trusts us, we need to trust Him. He holds the key to Hunter’s future and, as hard as it is for me to believe, He loves Hunter even more than I do. Hunter’s in good hands, when he’s in mine and when he’s in God’s. Learning to let go of the desire to control his future, something I simply cannot do no matter how hard I try, was a difficult lesson to learn. One I am probably going to have to learn and re-learn over and over again as we face new challenges with Hunter. In a 2012 you were speaking about the decisions parents have when adopting. Can you speak to the limits of control in open adoption? The main ‘complaint’ I hear from waiting adoptive parents revolves around the feeling that they have no control… over the wait, the birth parents, the process itself. This has always bothered me. When completing an adoption application, the choices you get to make are overwhelming! Health history of the birth parents, education of the birth parents, social history of the birth parents, prenatal care, degree of openness, amount of communication… all of this on top of special needs of the baby, prematurity, race, location, and age. There seems to be a sense of entitlement that comes with becoming an adoptive parent… especially when infertility is a factor in their decision to adopt. I can’t tell you how many times I’ve heard, “I wouldn’t drink if I ever got pregnant so I don’t want a baby who is exposed to alcohol” or “ADHD doesn’t run in our families so we aren’t comfortable with ADHD being in our child’s genetic background” and so many more. This attitude bothers me… especially now that our sweet boy is special needs. If we had limited ourselves… if we had checked off all potential special needs on our application checklist, we wouldn’t have our son. Of course not everyone is called or equipped to parent a child with special needs but it seems to me that ‘control’ should be the least of a waiting parents’ concerns. It just seems to be the most difficult challenge for them to overcome. Adoption doesn’t’ cure infertility. Our grief over our infertility will ebb and flow; you’ll continue to feel grief even though you experience the joy of parenting. They are two branches of the same tree. Speak about your grief and joy. Along with the devastation that comes month after month while undergoing infertility treatments, an adoptive couple experiences phases of grief when adoptions fail or when a match isn’t made. In my struggle to grieve over our recent miscarriage, I’m realizing that, while it’s easy to list the ‘steps’ of the grieving process, there’s a huge likelihood that the process will never completely end. I grieve our infertility every single month… even though it’s been 7 years and I’m completely satisfied with how our family has grown. I now grieve the loss of our third baby every single month… even though I know that God’s plan is greater than my own and I can’t understand it right now. The failed adoptions we experienced… I still wonder about those precious babies and my heart still hurts when I remember how much we wanted and loved them. I still wonder how they’re doing, where they are, who they’re with…. But I wouldn’t change a thing when it comes to how our family has grown and the 2 most perfect babies we have been given. I don’t think it’s fair when people try to get you to focus on the ‘blessings’ you’ve been given when you’re hurting. There’s no comparison between joy and sorrow… grief and thankfulness. They deal with different parts of your heart and they change different parts of who you are. Choosing joy can be a really hard thing to do sometimes… and I think it’s ok to not feel joyful at times, no matter how much joy you’re surrounded by. It’s also ok to feel stuck in your grief… there shouldn’t be a timeline that we need to stick to. What’s important is to give yourself ‘intermissions’ in your grief and joy… let there be a time to appreciate what you have and a time to be sad for what you’ve lost. Practicing these special times will eventually become a very natural and healthy balance in your grief and joy. When you shared, “But this adoption stuff? It still hurts. I’m not sure if it gets better and easier as you continue adding to your family through adoption or if it always hurts like this,” I wondered… Have you ever considered that the reason you may have experienced hurt is to possibly prepare you for what might be coming down the parenting road? What do you think? I think about this often. Our road to becoming parents and growing our family hasn’t been easy. When I think about the high highs and low lows, it’s obvious to me that God considers us strong and capable of the struggles we have faced, regardless of how we feel we’ll be able to handle them. In turn, He also considers us deserving of the incredible blessings He has placed in our lives. It’s hard not to get scared or intimidated when I think about all that we’ve been through and what that might mean for our future. And then I look around and know that what lies ahead doesn’t really matter, as long as we continue following God’s call for our lives we will always be fully equipped to handle the struggles and blessings that are ahead. Note: To read Lindsay’s interview of me (two-parts), click here. You can access other Project interviews, posted today and November 19th and 26th, here. Oh I just love these questions and answers! Vulnerability is something I touched on in my interview also. I really appreciate the reference to entitlement in adoption. I adopted my son at birth and he does have Fetal Alcohol Syndrome. I thank God every day for the boxes I checked on that form. If I had marked no to alcohol exposure I would not be mama to that wonderful young man. Do I wish he didn’t have FAS, yes of course, we all want our children to be as healthy as possible. But I cannot for a moment imagine my life without him in it. Thanks so much for participating and sharing so openly and honestly! Judy~ I consider it an honor to have had the opportunity to interview you and see firsthand, your heart for adoption. Thank you for your insight and honesty! Don’t miss my interview with Judy over at On Loan From Heaven… it’s a must-read! Thanks, Judy, for these thoughtful questions with Lindsay, as well as her thoughtful responses. I especially enjoyed reading the section on vulnerability, as I believe the ability to be vulnerable and open (with discretion, as Lindsay notes) is key in developing any healthy relationship, especially adoption relationships. Vulnerability, as tough as it is to sometimes embrace it, is a gift, a doorway through which we can enter a new realm of perspective, of being, or growth.